Home Facebook What Does The Lightning Icon Mean On A Facebook Post? What Does The Lightning Icon Mean On A Facebook Post? Many of us routinely read on our phones and Facebook is one of the more popular places where people get their daily dose of news and opinion pieces. The platform is so popular that it isn’t possible for an online publication to exist and not have a Facebook page. If you read on your phone, and frequently find articles to read in your Facebook feed, you might have noticed that some articles have a small lightning icon on them. The first thing that comes to mind here is that perhaps the post is tending but that isn’t what the icon means. The icon represents posts that are Instant Articles.Articles, regardless of which website they are published from, take a considerable time to load inside the Facebook mobile apps. It can take so long that you might decide to read the article later, or not at all. To counter this, last year Facebook introduced Instant Articles for publishers. Instant Articles load much much faster and created for the sole purpose that users wouldn’t have to wait for a web page to load and could instead get the content faster. 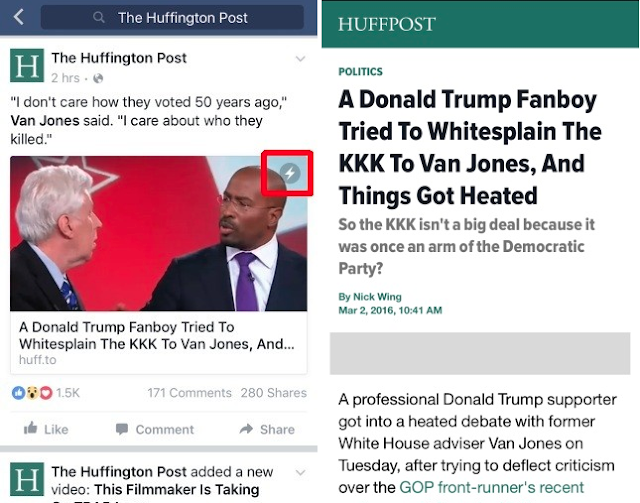 The articles themselves are generated using the same technology that Facebook uses to display other content in your newsfeed faster. The ads are of course still there but you will notice a drastically shorter load period when you tap on an instant article. The only downside is that Facebook is slowly and selectively rolling this feature out to publishers and users can’t request it for their favorite online magazines and blogs. Likewise, websites that would like to get in on this feature have to wait for Facebook to extend the offer.